When teaching any work of historical fiction or literary nonfiction, it is helpful to build students' background knowledge before jumping right into reading. In the lower grades, social studies is too often put on the back burner because it isn't a tested subject. Students' understanding of history suffers because it becomes the subject of least priority. 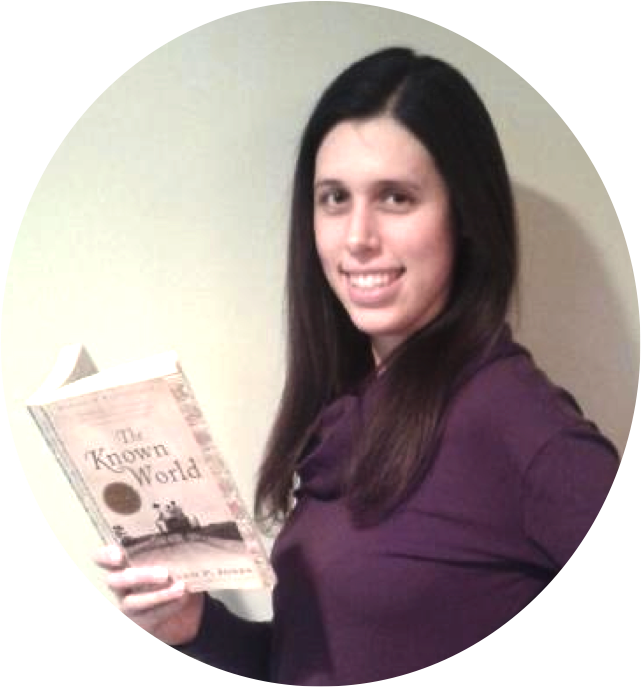 I find the practice of building background knowledge especially important when teaching a novel set against the backdrop the Holocaust. While some of my students have previously read a Holocaust related text, many have not and have little knowledge about the historical event. And understandably so, the topic can seem distant, unreal, even unbelievable to students. It can be hard for them to fathom so that many lives could be lost in such a short period of time, that one individual could wield so much power over other people, that most of the world stood by and watched while such tragedy unfolded. 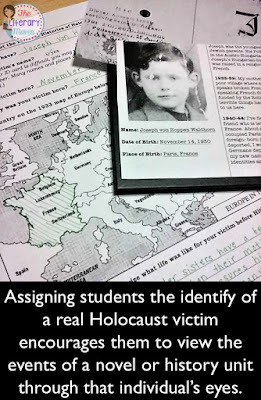 My first step to building my students' background knowledge is to do an overview of the before, during, and after of the Holocaust, including the events leading up to World War II, the persecution of the Jews and other groups, and the aftermath. This is a one day note taking lesson. I use a PowerPoint that presents the information in the simplest terms possible and provide fill-in-the-blank notes for students so that they aren't overwhelmed with the amount of information provided. Since I don't expect everything to stick on that first day, these notes become a great summary that students can refer back to throughout our unit. 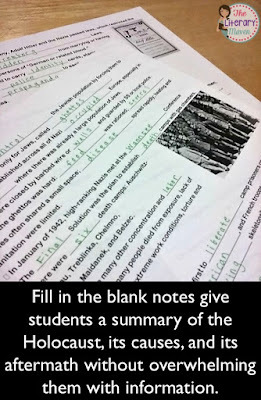 During the lesson, students can also jot down questions and make note of topics they want to know more about, both of which help me to tailor the unit to their needs and interests. 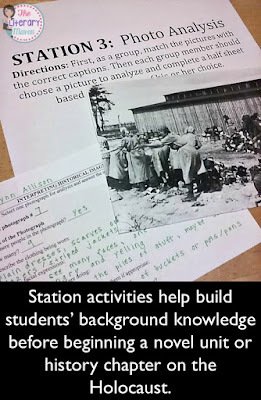 After a day of note taking, something I very rarely do, I use a set of station activities to get students to begin interacting with some of the information presented in the previous lesson. Some of the station activities relate to the Holocaust as a whole, such as matching caption descriptions with images and then selecting one image to analyze. Other station activities connect directly to the novel we will be reading, such as placing the events of Night author, Elie Wiesel's life in chronological order. Some of the stations require students to work as a group, while at others, students will work independently or do a mix of both. Based on indicated student interests from the previous lesson, I may add a media station where students watch and respond to a short video on a topic such as Adolf Hitler or the Nuremberg Laws. 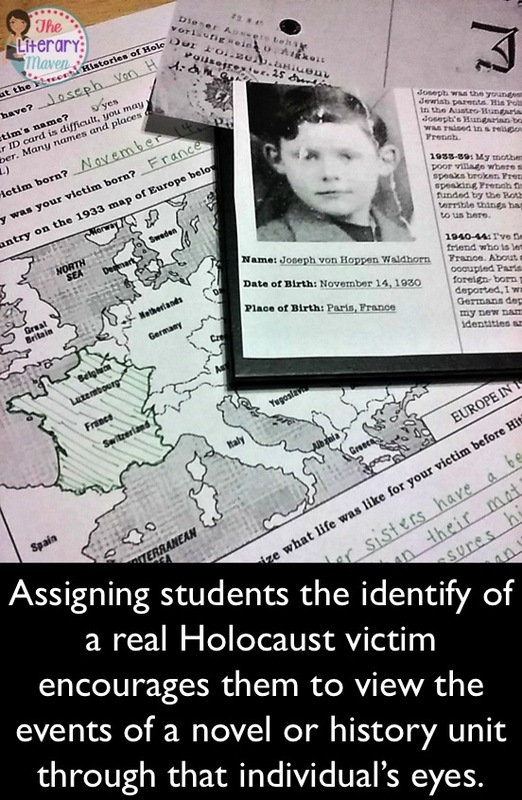 Once students have acquired some background knowledge on the Holocaust, I assign them the identify of a real Holocaust victim and encourage them to view the events of the novel or history unit through that individual’s eyes. The set of 37 Holocaust victim identity cards I use (information and images with permission from the United States Holocaust Memorial Museum) features individuals who were children and young adults during the Holocaust, some of whom survived and some of whom didn't. The cards include a photograph, the individual's name, date of birth, birthplace, and information about his/her life: a description of life before Hitler came to power, before World War II, and after WWII began. The cards feature individuals identified as Jews, but also Roma (gypsies), Jehovah’s Witnesses, accused homosexuals, mentally ill, and the “righteous.” This helps to make students aware that the Jews were not the only group targeted by the Nazis. As the students read about their assigned individuals, I pull up a map on my SmartBoard on which we plot the birthplaces of different victims and then compare this with a map of Nazi-occupied territory during WWII. Students discuss the similarities between victims as well as between the victims and themselves, and make predictions about what might have happened to them by the end of the war. At the end of our unit, I reveal to the students the fate of each of their victims, listed in a newspaper-like format. Some students become so invested in their assigned individual that they can't wait to find out from me and look them up on the internet instead. 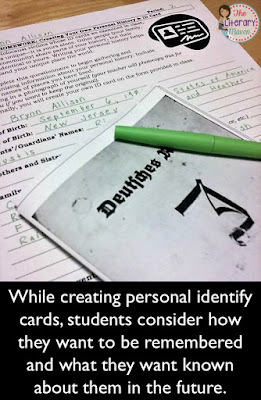 Throughout my novel unit, I refer back to these identity cards and ask students to respond to writing prompts from the perspective of their assigned individual. The writing prompts correspond with major events in the novel as well as the historical time period, i.e. the discrimination and persecution of Jews following WWI, life in the ghettos, deportation via cattle cars, and arrival in the concentration camps. As a mini-project, students create personal identity cards which ask them to consider how they want to be remembered and what they want known about them in the future. They take this project quite seriously after realizing that for many victims of the Holocaust, this identity card is all that is left of the person. With entire families wiped out, there are no children or grandchildren to tell the stories of their elders, just a few sheets of paper. Another way I foster student to text connections during this novel unit is by doing a mini-lesson on nutrition during the Holocaust. 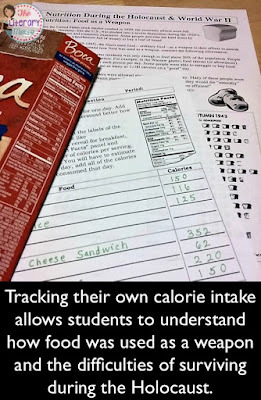 Either when reading about day to day life in the ghettos or concentration camps, students track their own daily calorie intake and then analyze information about food rations during World War II. Looking at the average daily calorie intake of someone living in a ghetto or concentration camp (300-500 calories) and comparing that to their own (recommended 2,000 calories) shows students just one of the difficulties of survival. Students also start to understand how food was used a a weapon; depriving people of proper nutrition was a way of controlling them, and eventually possibly killing them off. This mini-lesson would be a great opportunity for a cross-disciplinary lesson with the school health teacher or nurse, who could discuss necessary nutrients and explain how the lack of these essentials would affect one's body. I usually culminate this novel unit with a research paper on a topic of students' choice. I ask students to reflect back on the topics they indicated they were interested in during the initial note taking overview of the Holocaust. They may have also generated new ideas and questions while reading the novel. The Holocaust is a broad enough topic that all of my students are able to pick something that interests them. Since many of my students are struggling writers and have never written a research paper before, I use a highly structured, step by step guide to writing a research paper. Annotating a sample essay before students begin to write their own is key to students' success. The sample essay is a model that they can refer back to throughout the writing process. 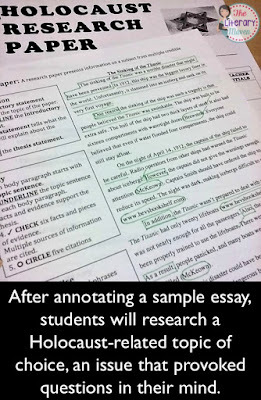 In the revision stage, students will annotate their rough draft in the same way, identifying all the necessary components of a research paper. Student investment throughout the unit and selection of a topic of personal interest keeps student engagement high throughout the research paper writing process. You can find all of my Holocaust teaching resources here. I just want to say that I'm a junior in college, studying to be a teacher and I have to prepare a thematic unit on a topic of my choice and I decided I'm passionate about the holocaust and the history behind it. This is an AMAZING AMAZING AMAZING unit. I've been searching online for different ideas and nothing compares to this! It's extremely engaging and gives the students plenty of opportunities to really experience the content. This should be a lesson they'll remember forever! Your students will benefit from this and thank you already for posting this! It's going to benefit so many more students! Thank you for the kind feedback. 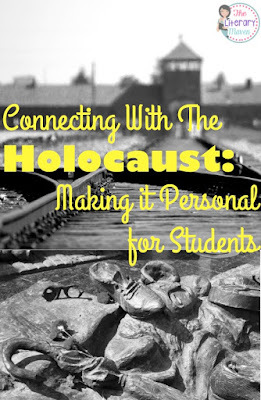 I know these activities deeply impact my students each year that I use them and hope that they bring to life the Holocaust and its history for other students as well. This is so awesome! We are currently reading "Number the Stars" and the kids have been so engaged with all of the information on this historical tragedy. These are some great ideas, and I can't wait to use them!